Cífàntuán is a kind of food in Chinese cuisine, originating from Shanghai. 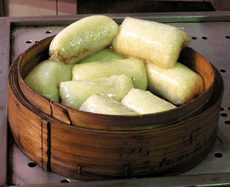 It is made by tightly wrapping a piece of youtiao (fried dough) with glutinous rice. It is usually eaten as breakfast together with sweetened or savory soy milk in Eastern China, Taiwan, and Hong Kong (where it is known as chi faan). In recent years, there have been innovations on the traditional cifantuan, originating from Hong Kong and Taiwan, then reverse-introduced into Shanghai and its vicinity. Today, cifantuan is commonly available in two varieties. The "savoury" variety includes ingredients such as zha cai (pickled vegetable), rousong (pork floss) and small pieces of youtiao being wrapped in the rice ball. The "sweet" variety adds sugar and sometimes sesame to the filling. ↑ News365.com.cn. "News365.com.cn." 上海的小吃. Retrieved on 2009-08-15. ↑ Phoenix television. "Phoenix television." 糍飯糰與豆漿. Retrieved on 2009-08-15.